Satyajit Ray was one of those artists whose influence extends beyond his own culture to become an important part of our shared human heritage. Even if you've never heard of Ray you've been touched by his influence--echoes of his cinematic legacy are present in our own culture today, from E.T. to The Simpsons. Ray wasn't just India's most renowned filmmaker, he was one of the most important filmmakers in the history of the cinema. In the opinion of many, Satyajit Ray was the greatest filmmaker in the latter half of the 20th century. Ray's films are acclaimed internationally for their inventive technique, literary depth, and profound humanity, and UCSC's Satyajit Ray Film and Study Collection (Ray FASC) was established in 1993 by Professor Dilip Basu to preserve Ray's work and make it accessible to the public. Ray FASC was recently awarded a grant of $210,000 by the Packard Humanities Institute to continue this important work. In addition, Dr. Anu Luther Maitra has announced that she will provide an endowment of $100,000 in the name of her late husband, Siddhartha Maitra, to establish the Siddhartha Maitra Endowed Lecture series. Satyajit Ray was an extraordinarily diverse talent. He wrote his own screenplays, frequently based on stories he had written. A talented graphic artist, he sketched out his own storyboards and even designed promotional posters for the finished films. He often shot and edited his own films, and composed his own film scores. Ray made 29 feature films and 10 documentary and short films in his career. Working with limited budgets and primitive filmmaking tools, Ray made what many film scholars regard as masterpieces of the cinematic art, including The World of Apu, The Music Room, Charulata, Devi, Days and Nights in the Forest; and Chess Players. Incidentally, Matt Groening, creator of The Simpsons, acknowledges taking the name Apu for his character on the television show from Ray's Apu Trilogy. Ray died in Calcutta in 1992, shortly after receiving an Oscar from the Academy of Motion Picture Arts and Sciences for lifetime achievement. In the opinion of many, he was the greatest filmmaker in the latter half of the 20th century. He received many honors in his lifetime including the Oscar, the Bharat Ratna (India's highest civilian honor), an honorary doctorate from Oxford University, the Berkeley Medal from UC Berkeley, and the Legion of Honor from French President Francois Mitterrand, who traveled to Calcutta to make the presentation personally. But although Ray was always highly respected as a filmmaker, his relations with Hollywood weren't always harmonious. In 1967 Ray wrote the script to a science fiction film he wanted to make called The Alien. Peter Sellers was interested in the lead role, and Marlon Brando in the second lead. With those two stars on board, Columbia Pictures contracted to do the picture, but things did not go well from the start. Ray was alarmed to discover that producer Mike Wilson had copyrighted the script Ray had written in both their names. When Ray went to Columbia's London offices for further negotiations, he found Wilson hosting lavish parties in his hotel suite for rock stars and assorted glitterati. Brando soon dropped out of the project and if Ray found Wilson's tactics disturbing, Columbia executives exacerbated the situation by suggesting that Wilson had appropriated his script fee. An attempt was made to bring in James Coburn to replace Brando, but by then Ray had had enough of the Hollywood machine and maneuverings. He returned to Calcutta and abandoned The Alien project. Columbia tried to persuade him to take on the project again in the '70s and early '80s, but nothing came of it. In 1982, when Steven Spielberg's blockbuster E.T. was released, the plot bore a striking similarity to Ray's script for The Alien, and was produced by the same company that had contracted with Ray in 1967. The similarity was considered by some, including Ray, to be more than mere coincidence. He told the Indian press that E.T. "Would not have been possible without my script of The Alien being available throughout America in mimeographed copies." For his part Spielberg has denied plagiarizing Ray's script. "I was a kid in high school when his script was circulating in Hollywood," Spielberg told the press in 1982, when the issue was first raised. Whatever the truth may be, The Alien, if it had been made, certainly would have upstaged E.T., and probably Spielberg's previous effort, Close Encounters of the Third Kind, as well--not to mention forced Ridley Scott to seek another title for his 1979 production, Alien. 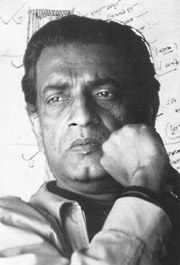 Ultimately though, Satyajit Ray was an artist who didn't need the help of Hollywood to make great films, and his international reputation and enduring legacy were established without the enormous budget needed to produce a Hollywood blockbuster. Yet in spite of his international acclaim, an assessment report made by David Shepard, director of the Film Preservation Associates and a member of the Academy in 1993, found 18 of Ray's early films badly deteriorated. To make matters worse, the original negatives of six of Ray's classics were destroyed in a London film laboratory fire the same year. Since 1993, the Ray FASC, in conjunction with the Ray Society in India and the Academy of Motion Picture Arts and Sciences, has worked to orchestrate the rescue of Satyajit Ray's cultural legacy. Eleven of Ray's 29 feature films have been professionally restored, and the remainder are either in the process of being restored, or are scheduled for restoration. Ray FASC has established a collection of Ray's films in 35mm and videocassette, as well as his books, artwork, and papers, still photographs, posters, and newspaper and magazine articles in many languages about him and his work. The collection is the most comprehensive on Ray, and one of the most complete on any single auteur, anywhere. The two-year Packard grant will allow Ray FASC to hire a curator to inventory and catalog the Ray collection so it can be made available to scholars and students on a regular basis. The grant will also allow Ray FASC to hire part-time student help, purchase additional materials needed to complete the archiving, and initiate scholarly research on Ray's work and ready it for publication. In addition to the Packard grant, Dr. Anu Luther Maitra has announced that she will establish an endowment of $100,000 in the name of her late husband, Siddhartha Maitra. The Siddhartha Maitra Endowed Lecture series will bring in distinguished filmmakers, writers, and film scholars to deliver an annual lecture in association with Ray FASC. Since its establishment in 1993, Ray FASC has made significant progress in preserving the precious cultural legacy of Satyajit Ray, but much remains to be done. If you would like to offer assistance, or avail yourself of the treasures in Ray FASC, contact the project at (831) 459-4012; fax (831) 459-3125, or e-mail. For more information on Ray and Ray FASC, visit the web site.